The 2015 World Tour starts on Tuesday with the Tour Down Under. The TDU is now an established race, what was once a training race in the sun is now a tough competition where the only concession is the short stages. Here’s a preview for the Tour Down Under with stage profiles, contenders, TV times and more. The action begins on Sunday evening with the “People’s Choice Classic”, a 50km criterium by Adelaide University. It’s a separate event and the Tour Down Under starts on Tuesday. After two laps around the Barossa vineyards the race heads for the Adelaide suburbs and a new finish in Campbelltown. The hills come late and in between the categorised climbs come more rises and some twisty roads. It should be a sprint finish but if everyone expects Giant-Alpecin to work by itself there might be chances to escape. The finish has been described by the race director as “a very tough, uphill sprint” but the profile looks flat… as does the road itself. One for the pure sprinters with a very long finishing straight. A familiar stage with the undulating circuit around Stirling with its three repeat climbs. It’s a punchy finish and possibly decisive, Tom-Jelte Slagter won the race in 2012 with his stage win here. Watch to see who’s in the mix and who has been dropped. Richie Porte and Cadel Evans need to contest the time bonuses but the finish suits Heinrich Haussler (IAM Cycling), Nathan Haas (Cannondale-Garmin) and Daryl Impey (Orica-Greenedge) more. A new finish for the race with the abrupt climb of Torrens Hill Road. The approach to the final climb is crucial, the twisting Gorge Road will see teams scrapping to place their leader at the front for the final climb. Torrens Hill is 1.2km at 9%, a sharp effort but beware as the climb ends with a flat section just before the line, anyone charging up the hill will have to change gears and sprint for the line, the final 250m could feel a lot longer. The early part of the race runs south and parallel to the coast before the race sweeps inland. Mount Barker might suggest a hilly stage but this should be for the sprinters. But note the climbing in the final 40km, if the wind gets up it’s possible some teams gang up to try and drop Marcel Kittel, forcing the pace on the hills to leave him and his team isolated. If not a classic sprint awaits on a wide, long and flat finish. The big stage and regular rendez-vous with Willunga Hill. A gentle start with three laps past wineries. After 120km the circuits end and the race heads for the hills. Old Willunga Hill is the key moment with 3km at an average of 7.5%, a steady gradient most of the way and is climbed twice. It’s often decisive for the race, a total effort is required but go too early and you risk being swamped and out-sprinted for the precious time bonuses. There’s no profile for the stage, it’s all flat and. A criterium race in town, it’s could be a victory parade but it won’t be slow. If the GC is still in play thanks to the time bonuses – intermediate sprints included – then expect a contest to the end. Bonus time: 10 seconds for the winner of each stage, six seconds for second place and four seconds for third. Intermediate sprints offer 3-2-1 seconds respectively for the first three. It’s hard to pick riders given it’s the start of the season, there’s only the Australian national championships to gauge rider form, the others are judged by reputation and suitability. 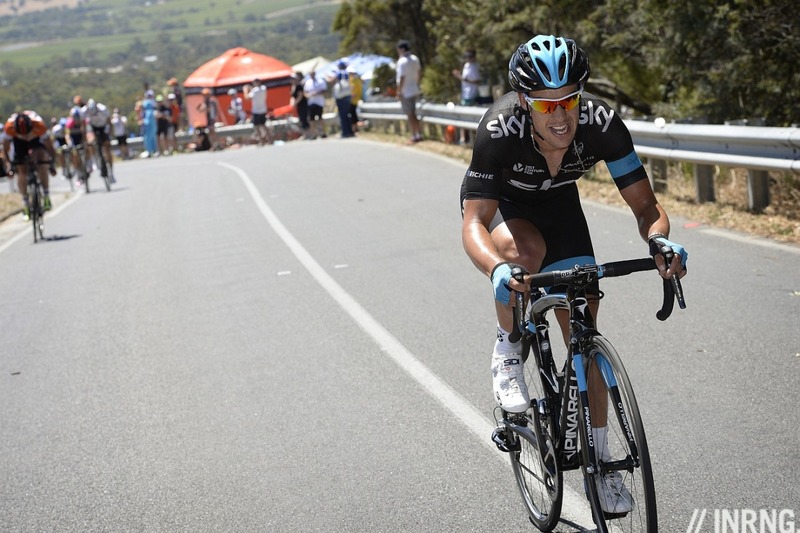 Richie Porte is the prime pick. The Tasmanian has just won the Australian time trial title. Now the TDU is on his shopping list before bigger expeditions later in the year. He comes with a strong team where Geraint Thomas and Peter Kennaugh bring options but are these two aiming to peak like Porte? I think not but they might be more punchy than Porte though for time bonuses. 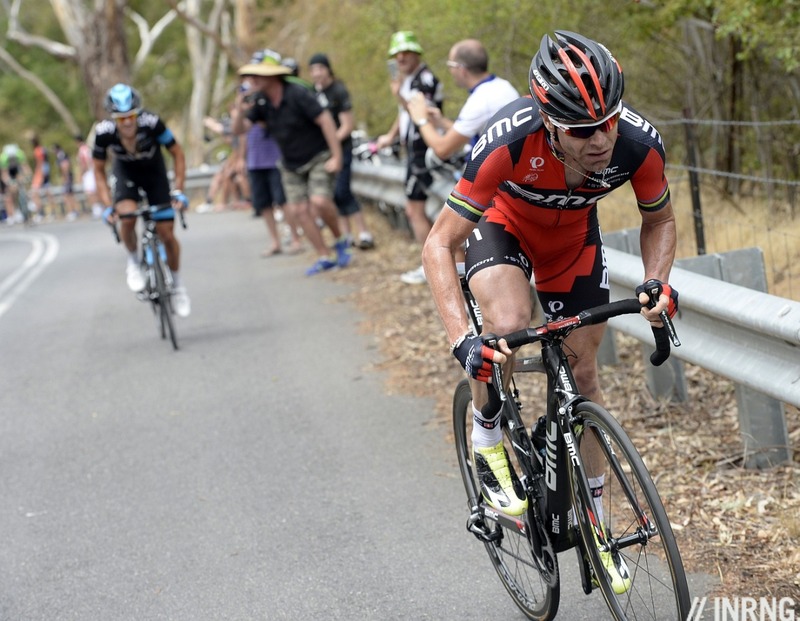 Porte will have to finish well on each stage until Willunga and then jump away for the win. Easier said than done on the best of days and tactically obvious and so it’ll be interesting to see if Sky try anything else. Cadel Evans has been training just for this race. Last year’s course with the Corkscrew climb probably suited him more, he escaped on the steep climb and won’t have such a suitable opportunity to gain time until Willunga Hill where, just like Porte, his move is expected. He comes with a strong team but Rohan Dennis is preparing for hour long efforts while Peter Stetina is a back-up on the hilly days. Nathan Haas is the stealth pick, he’s a versatile rider with a fast sprint who could triumph thanks to time bonus arithmetics, scoring on days when the main sprinters are thwarted and hanging tight on Willunga. He leads a strong team with Moreno Moser, a rider who could be perfect for the race if he can recapture the form of 2013 and Lasse Hansen, a big talent. You wonder who will carry the bottles with punchy talents Jack Bauer and Davide Villela, climber Alex Howes and Ryder Hesjedal onboard too. A mention of Adam Hansen, famous for riding three grand tours but he’s been winning stages along the way including the Vuelta. He can look big framed but climbs very well on these 5-10 minute efforts. Still actually winning stages and contesting time bonuses sounds harder, although without André Greipel for once, Lotto-Soudal can give him full support. A podium is possible. 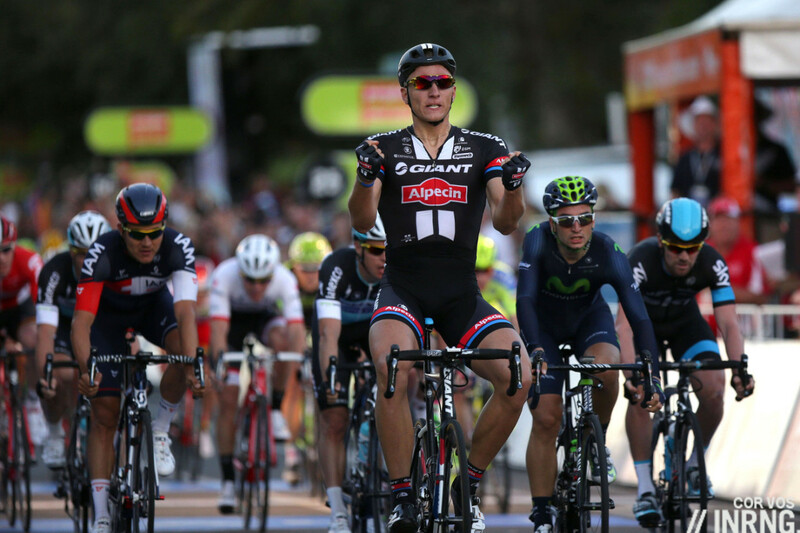 Luis Leon Sanchez is a past winner and returns with ambitions. Belkin dumped him overboard and after a spell with Caja Rural he’s now joined Astana, race boss Mike Turtur must be praying he doesn’t make the podium. He’s done well here before but the race was different back then and he’s older too. Team mate Lieuwe Westra is one to watch too. Tiago Machado has done well here in the past but placing is one thing and winning another and it’s hard to see Katusha’s new signing improve, the Russian team also bring Giampaulo Caruso, a useful climber but the hills of South Australia might not be long enough for him. A similar story for Movistar’s Gorza Izaguirre, usually a loyal domestique but 7th overall in 2013 and he might have his chance again, ditto José Herrada. The Flea of Policoro, better known as Domenico Pozzovivo, is Ag2r La Mondiale’s leader. He’s a punchy climber but a rare winner, so mentioned by reputation but an uncertain prospect, he’ll be well supported by Christophe Riblon and Blel Kadri, two riders who have had great Tour de France wins but need to back these up. Could Heinrich Haussler do it? As a sprinter he could collect time bonuses here and there and he’s clearly in form and lean too. But he could fall between two stools, losing to others in the sprint while Willunga could be too much but “Heino” would be a popular winner. Others to think about include Michael Rogers, who was “only” 8th in the Australian TT champs, a relatively discreet performance for someone who was once world champion. The Sprinters: Marcel Kittel is head and shoulders ahead of the others. It could make the race more open with everyone expecting Giant-Alpecin to chase the breakaways but the German team can’t do all the work by themselves. Watch out for Juan-José Lobato of Movistar who is due a big season. 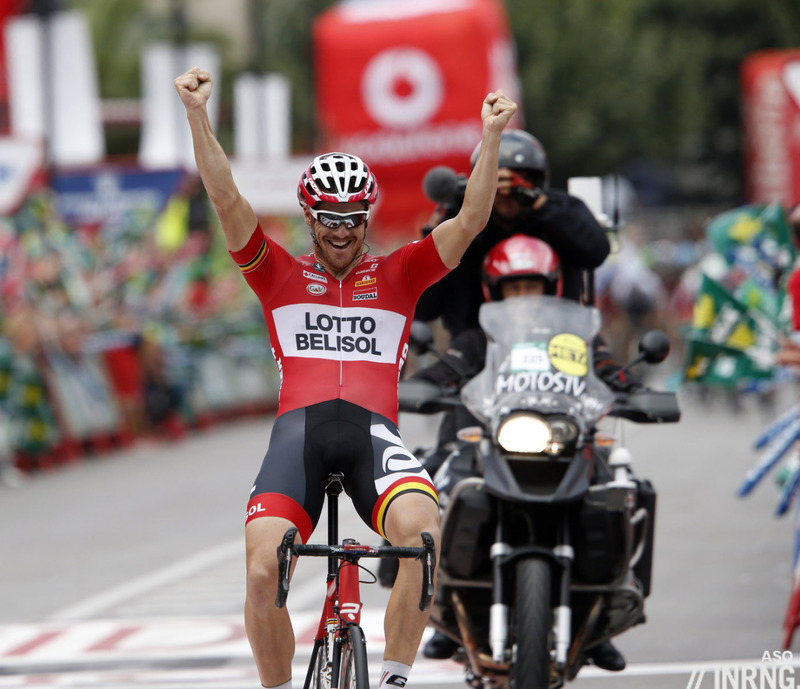 Drapac’s Dutchman Wouter Wippert had a prolific 2014 and could give the team the success it craves. Trek Factory Racing’s Giacomo Nizzolo is coming of age. Etixx-Quickstep’s Gianni Meersman’s form is unknown but he’s excellent on the hilly finishes. Lotto-Jumbo bring Barry Markus. There are other locals including Mark Renshaw of Etixx-Quickstep, Chris Sutton at Team Sky plus Kiwi Greg Henderson of Lotto-Soudal. TV: It’s on Australia’s Channel 9 and Gem, the live coverage alternating between the channels. British viewers can see it on Sky. If all goes well it can be viewed online at http://wwos.ninemsn.com.au/article.aspx?id=8785996 but we’ll have to wait for the race to start to make sure it’s not geo-restricted outside Australia. Otherwise this marks a return to the furtive practice of watching via a pirate stream and cyclingfans and steephill.tv are the default choices. Here are the forecast finish times, note Australian Central Daylight Time in Adelaide is UTC/GMT + 10.30 hours. i hate to sound nit-picky but when you’re talking about LL Sanchez you wrote “back ten” instead of Back then, great article though, your race previews are the best. Thanks, all corrections welcome, think of it as helping the next reader. Another site I’m on has a typos@ email address, to avoid cluttering comments. Presumably you accept typo sightings via twitter too? Promising, I hope it’s working and not geo-restricted. It worked for me – but the feed was pretty patch, kept cutting out and freezing to the point where I coulnd’t watch it. I am in the UK – I suspect not the broadcaster’s intended audience. A very thorough preview. The only thing I would add is that there is a second concession for the riders – staying in the same hotel for the duration of the Tour as all the stage finishes are only a short drive from the Adelaide CBD. It’s popular for that reason. Also when you look at the stage maps, there are a lot of overlapping roads, a route used for one stage is used in reverse another day etc. I’m surprised Orica-GreenEdge didn’t bring Caleb Ewan for the sprints. It would have fun to ‘see’ him in Kittel’s slipstream and attempt to come around. Must be harder to make the Orica-GreenEdge roster for this home race than it is for riders on other teams. I’m sure they don’t want to put a big pressure on him from the beginning. He has his chance in Nationals and will have more in Cadel Race and Sun Tour. More then enough for first month of his first pro season. I really try, but I can’t get excited. Can’t help it. But I am happy for the people outside of Europe that they get to see some live WT-action. It can be actually be surprisingly good to watch. No mountains but the race directors choice of twisty bumpy roads and the shorter stages actually make the race quite action packed. The teams have a lot more trouble than normal keeping control. I hear you. It’s hard to get excited about road racing when the cross season still isn’t over, with the last round of World Cup and World Championships ahead of us! Come to Adelaide to watch it and you’ll get excited. Absolutely! I’m in Adelaide and am going to watch stage 2 tomorrow. Feeling pretty lucky to see riders live in the flesh when I’m so used to watching from a distance on teev at way too bleary hours of the night/morning. 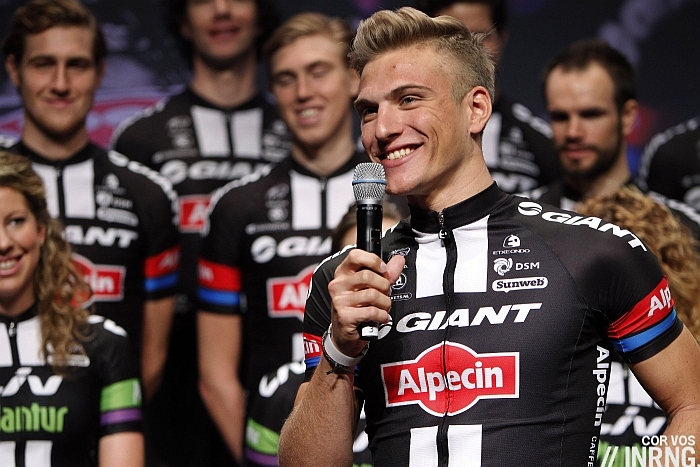 I should probably know, but where is the first photo – of Kittel already winning in Giant-Alpecin colours – from? Thanks. I think the photo is from today’s People’s Choice Classic in Adelaide. It is the curtain raiser crit for the Tour Down Under. Lobato (Movistar) was second. Wippert (Drapac) was third. Surprised you didn’t mention Tom Dumoulin. I belive he has to be in decent shape if he decided to come to Australia in January. Otherwise he would wait and begin in Oman for example. Not many big names came to Australia just to catch miles. Also, Power & Haig worth a mention. Both capable of top 10 GC. I couldn’t see Dumoulin outsprinting the sprinters for time bonuses or outclimbing the climbers to take time, plus he might be on duty for Kittel. I suspect he’ll win a stage race later in the year though. I thought Evans had retired, must have missed something. Looking forward to watching this anyway. His last race I believe. Retiring after it – presumably wanting to go out on a high in a last race at home? I’d make him favourite actually just about, given this is the be all and end all for him this season – it’s whether that’s enough to leap frog him over better cyclists who might not be in top form at this stage of the season. Will be interesting to see how it goes, for Cadel and as a new ‘classics-inspired’ race in general. 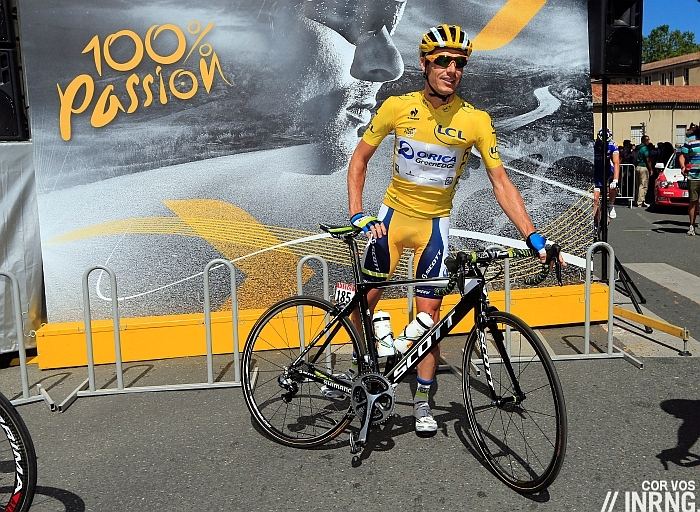 he bows out in a couple of weeks… After he competes the Cadel Evans Great Ocean Rd Race named in his honour. Back to that first pic from Adelaide: I guess IAM didn’t manage to ship Haussler’s new jersey down to Aus yet? As it was a criterium, it was Steele Von Hoff in the green and gold jersey. Haussler’s got his for Tuesday, he’s been wearing an IAM version almost as soon as he won the race. Is that a UCI rule on national champ jerseys in crits? Thought I saw Kennaugh in his GB one but Adam Blythe is the GB circuit race champion. I think the rules are all a bit fluid on this – have seen it over and over again with various riders. Perhaps it depends on how hardline the particular Fed wants to be about it. I must have missed something; why would Turtur not want LL Sanchez to make the podium? (I assume there is a drug association). I wonder if this was not on the World Tour, how many teams would actually go, given the absolute lack TV coverage in their prime market, i.e. Europe. If expenses are paid, and they are with business class, then many teams enjoy the week. Plenty of teams go to the tour de san luis, which has the restrictions you talk about, so my guess is that plenty would still go to the tour down under given the competition there now and lack of alternatives this time of year? Excitement or otherwise, I know where I would rather be, than scraping ice off the windscreen here! 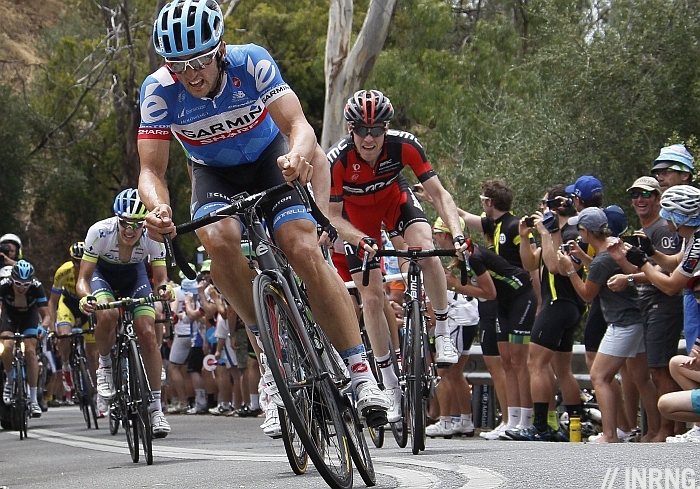 I enjoy the TDU especially since they started including some climbs. 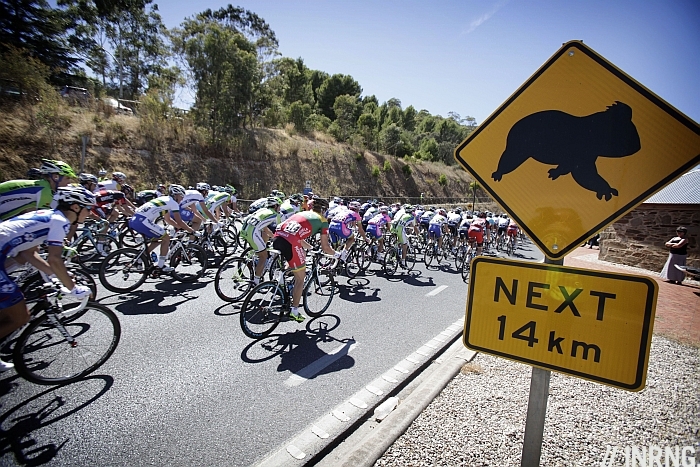 I like the familiar signs it brings that herald the start of the main cycling season, from the silly rider-with-joey-or-koala photos, to seeing the usually azure blue skies and the sun, to the excitement building for the showdown on Willunga Hill. You can even set “HD”… Youtube’s HD, obviously enough! ^that was meant for gabriele! …remember the ESPN accident right there in San Luis 2009? all about the $$$ I assume? Are race radios operative in the TdU? I thought radios were not allowed in WT this year. The rulebook on the website from September to December said they weren’t… but the UCI has since quietly updated its rulebook to correct this. So yes, radios are allowed in 2015 but they’re supposed to be banned in 2016. We’ll see.